The height on 360 Smith Street condominium project is being calculated under the “Wide Streets” Zoning Text. The rearyard extension of 122 First Place resulted in my viewing of cinderblocks instead of the sunrise out my kitchen window. The mechanical units on the roof of the recently renovated Hannah Senesh Community Day School. 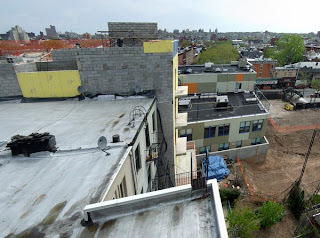 I am continually dismayed that the school had so little respect and understanding of its new home in Carroll Gardens that its Board of Directors approved a design that willfully violates the urban context of our historic rowhouse brownstone neighborhood. And I am constantly amazed that architecture professional journals continue to applaud willful buildings that violate the urban contexts in which they are located, as though exciting architecture is only possible to the degree that it’s contextually inappropriate. As a follow-up to the meeting at the CB6 Landmark/Land Use Committee on Thursday, April 24th, which approved the proposed Zoning Resolution Text Amendment to define the Place blocks and Carroll, President, and Second Street, between Smith and Hoyt Streets, as “Narrow Streets” for zoning calculation purposes. I appreciate the concerns of the lady who was almost crying because she claimed that she might lose her property rights. But there has to be a balance between property rights and the rights of preserving our neighborhood. 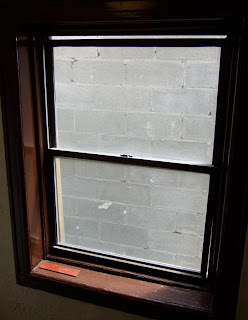 The apartment house adjacent to where I live on First Place recently built an extension in their rear yard, which resulted in the lost of the window in my kitchen and stairwell. Every morning I miss my 20-year ritual of looking out this window to watch the sunrise, and seeing the people at the subway plaza, enjoying my neighbors amazing homing pigeons soaring above or perched on the clothes lines in the backyards, as I fix my breakfast. My neighbor exercised their rights as a property owner and now I get to look out on their cinder block wall (see above.) Do only property owners have rights? What about my right for air and light? The NYC Department of Planning Incorrectly Mapped these Streets as "Wide Streets." Carroll Gardens is a planned community, created by law in 1846 and 1852, and the Department of Planning incorrectly mapped these streets as “wide streets”. The proposed Zoning Resolution Amendment addresses this error. The old Brooklyn law, which is attached to the deed of every property on the Place blocks, sets the metes and bounds of the neighborhood with two 13-foot sidewalks and a 24-foot “carriage way” equaling 50 feet. The Zoning Resolution considers a Wide Street any street 75 feet or more in width. The old Brooklyn law specifically notes the northern and southern limits of the streets, with respect to a starting point of the street, clearly indicating that the street line begins at the sidewalk edge, not at the building line. Interestingly, Butts elected to eliminate one street in the normal street grid and then evenly divide up that left over space to create courtyards between the street lines and the building lines. I consider protecting our heritage as a noble mission that benefits everyone, and that I want to whole-heartily thank the community board our local elected officials for supporting this Zoning Resolution Text Amendment!